Note: Pricing does not include chair or cushion, bimini cabana only. Discounts available for larger quantity orders. 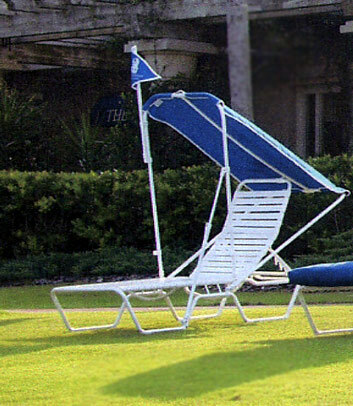 Enjoy and extend the time spent outdoors in a healthy, comfortable environment with the Sun-Bimini Sun Shade. The Sun-Bimini is lightweight and provides infinite shading adjustment with an easy to reach adjustment knob. Brighten up the pool or beach areas with any of our three styles. There are many beautiful colors available to match any decor. The Sun-Biminis fold down and are stackable for easy convenient storage. Dimensions:52in. x 10in. x 34in. Bimini Trim Accent, your Company Logo or Family Monogram. See below for related products.